Who Is Jackie’s Father Mr. Geary on The Goldbergs? Who Is Jackie’s Father Mr. Geary on ‘The Goldbergs’? In The Goldbergs episode “Spaceballs,” Adam Goldberg (Sean Giambrone) tries to start a Mel Brooks club after he sees the movie “Spaceballs.” He makes a killer Dark Helmet costume (which is voiced by Ric Moranis, who played Dark Helmet in the 1987 Mel Brooks comedy Spaceballs!). When Adam’s girlfriend Jackie (Rowan Blanchard) sees Adam’s ad for the club she mistakes it for political satire and puts it in the school paper. When Adam comes over to the Geary house for dinner, the conversation turns awkward. 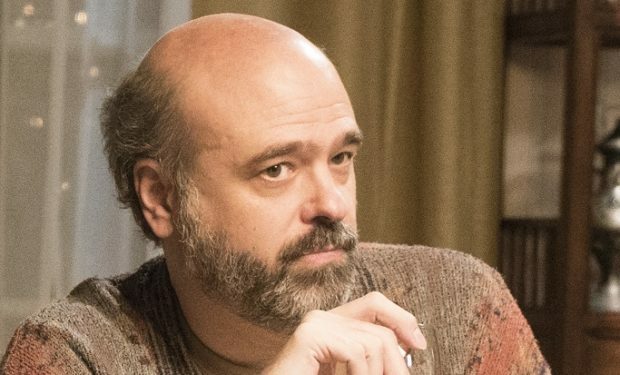 Mr. Geary is portrayed by Scott Adsit. The Second City comedian is known for his on-camera roles on Veep (Greg) and 30 Rock (Pete Hornberger), and as the voice of Baymax in Big Hero 6, among others. The Goldbergs airs Wednesdays at 8pm on ABC, right before Alex, Inc.